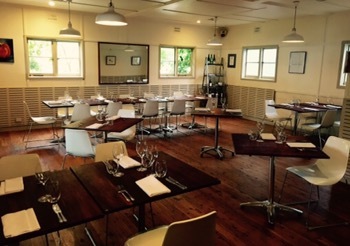 Monster Kitchen is Good Food’s number one Canberra restaurant – and it’s not hard to see why. 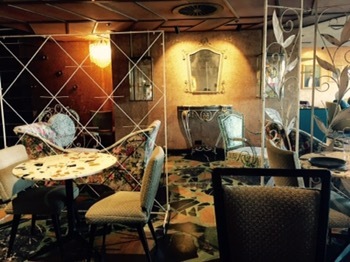 Quirky and welcoming, the eclectic decor is engaging. But it’s the food that is the real star. Our lunch dishes were perfect! 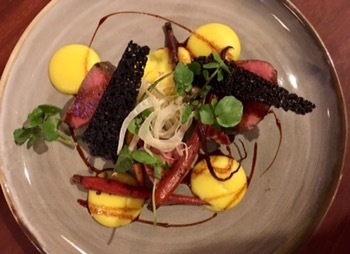 Beautiful, well priced and a unique combination of ingredients and textures. 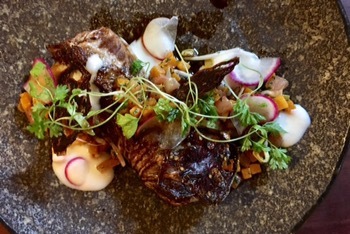 I especially liked the pairing of the goat’s curd with the eggplant and the yogurt with the lamb shoulder. 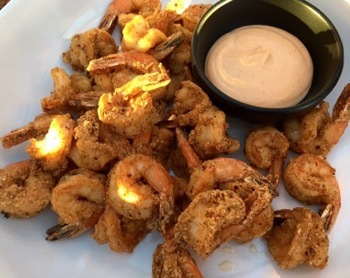 Thses gave the dishes a delightful creamy highlight. But I also loved the salty elements of the soy with the tofu and the katsuobushi with the eggplant. The textured coating on the tofu had a lovely light crunch. 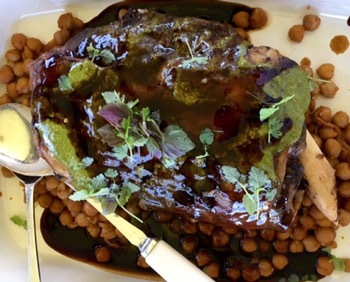 I loved the colour and crunch of the pistachios and pomegranate with the lamb’s shoulder and the gorgeous green tinge on the tofu. 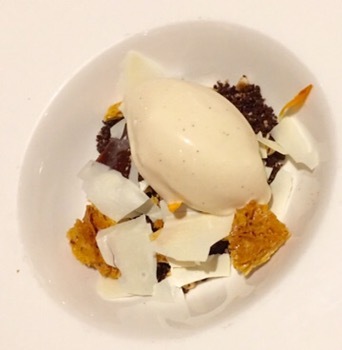 We finished with a dessert of Soft chocolate with mandarin, almond and rosemary $20. 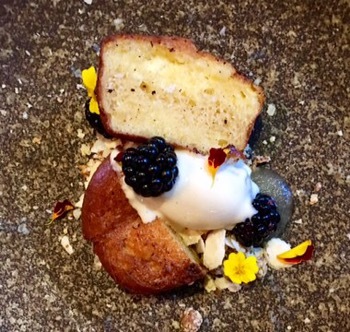 This was also a perfect balance of textures and flavours, especially the ice-cream that came with it. 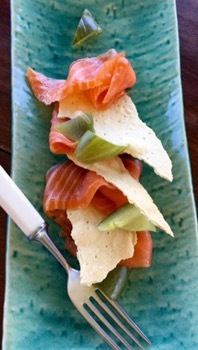 The crisp garnish was excellent as was the puree garnish but the fresh mandarin would be better preserved. 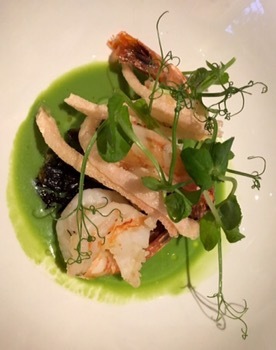 Still on my wish list for another time is the Yabby Waffle $20, the Boxgum grazing beef tartare $23 and the Green tea dessert with coconut, raspberry and mille feuille $18. I also want to try the Monster Light Lunch that offers specials like Spagetti with wagyu tongue, peas, capers, reggiano and chilli $17, Baby beet salad with wild rice, pear, walnut $16, Pork belly banh mi $13 or Boxgum grazing ham, pyengana cheddar and green tomato pickle $15 sered 12-5pm daily. 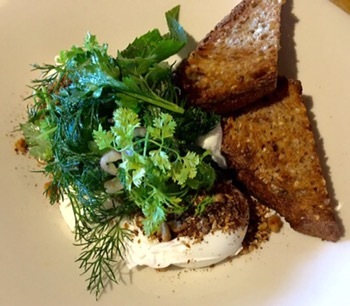 Canberra’s best breakfast – Pod Food Pialligo! I’ve enjoyed the hospitality of Pod Food a couple of lovely times lately, but now, after trying their breakfast, I’m a total fan! It must be the very best spot for breakfast in Canberra! 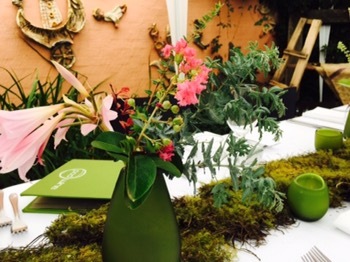 Even in this chilly weather, the garden setting is gorgeous and beautiful from the cosy verandah. 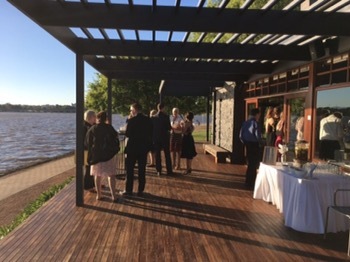 It was just perfect on a winter Canberra weekend. To be honest, I’d only ever heard about the $40 four course breakfast degustation which I’d flagged as a special occasion event. 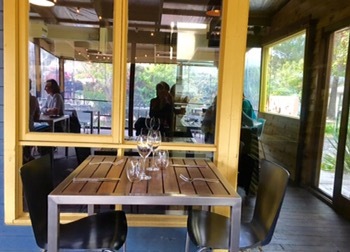 But now I know that there’s a whole other a la carte menu with average Canberra prices, but way beyond average dishes……in such a lovely setting, served by Sam’s top class team, I wouldn’t ever want to go anywhere else! Hard as it was to choose just one dish (hence the allure of the degustation) I was very pleased with my Field mushroom bruschetta with miso, smoked ricotta (so good), baby spinach and sourdough $19. 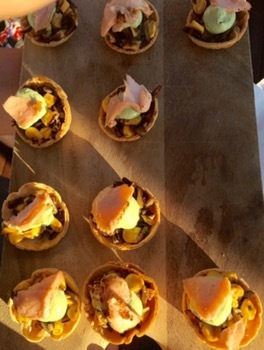 Every mouthful was a joy! 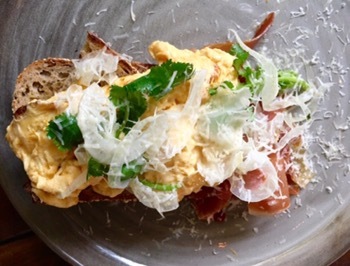 But the Srambled eggs with Jamon, fennel and herb salad and Three Mills seeded sourdough $19 also looked very good. 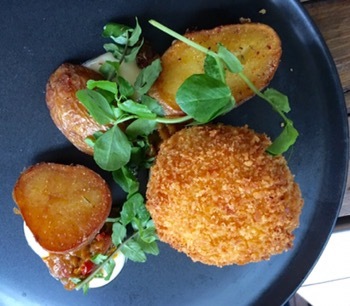 Those who chose the Potato and bacon wrapped egg with salt baked potato, pecorino and capsicum relish were delighted, $20. 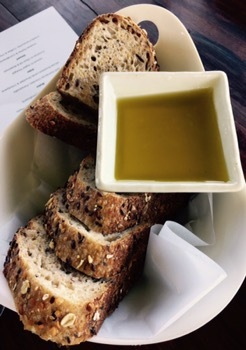 And for those times that you just want something light, the $12 Three Mills seeded sourdough toast with Pialligo honey, preservatives and whipped butter was perfect. Even though we were just coming for breakfast, Sam called to check special diet needs and confirm the booking. 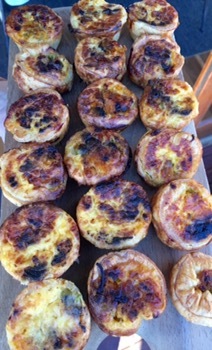 There’s nothing ordinary about breakfast at Pod! And, you won’t believe this, if you have the Canberra Entertainment Book, there’s even a 25% discount! This is fine dining standard at mid range prices! 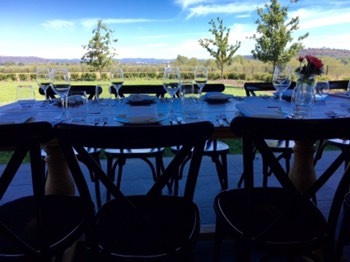 Pialligo Estate is one of my three favourite Canberra spots for fine dining. It is blessed by the most gorgeous setting, so close to town. 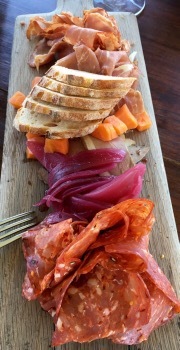 And Pialligo Estate does food and wine so well, enjoying it’s own vineyard, winery and smokehouse. 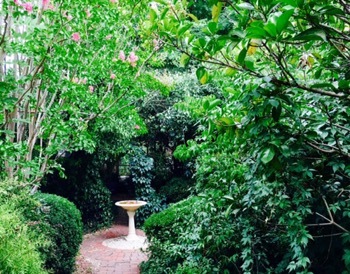 I especially love the Garden Pavillions that truly make the most of Pialligo Estate’s assets. 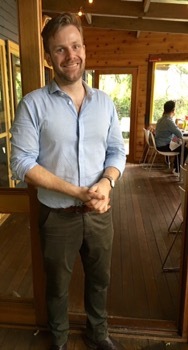 So I was especially pleased to be there to try a group set menu lunch, a new experience for me at Pialligo. 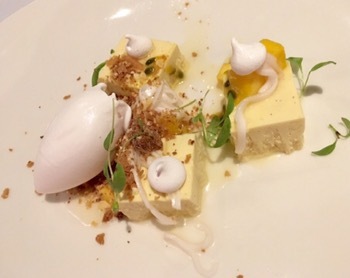 This pannacotta was the most lovely I’ve ever had and the star of the meal. I will need to enjoy that again! I do love all the innovative things Pialligo Estate gets up to. 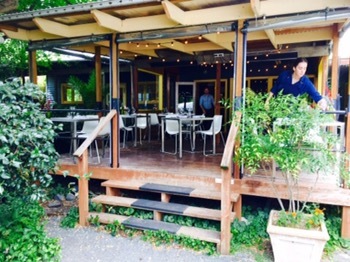 They are currently renovating the Farmhuse Restaurant and Rohan has more plans in mind. The new Masterclasses are on my wish list. 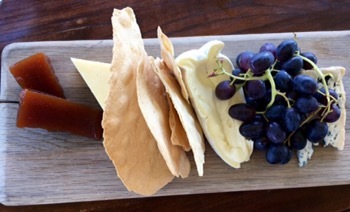 So exciting to see the offerings from Pialligo Estate constantly evolving with new delights. 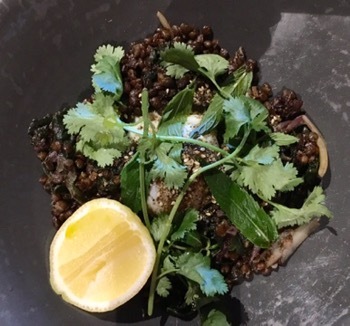 The Canberra Food Bloggers road test the new menu at Pod Food! 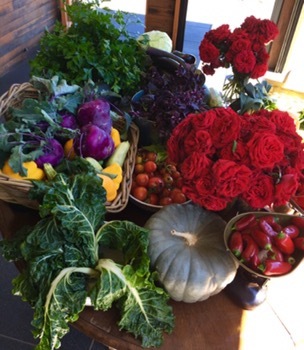 Canberra has a lovely and lively community of people writing and posting about food! 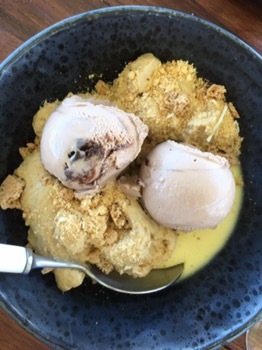 The food bloggers are an especially social bunch and we love to get together for lunch every couple of months and enjoy some of Canberra’s wonderful venues. 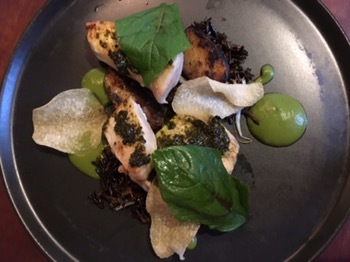 This week Bizzy Lizzy took us to try out Pod Food’s new menu, in the conveniently close but relaxingly rural Pialligo. 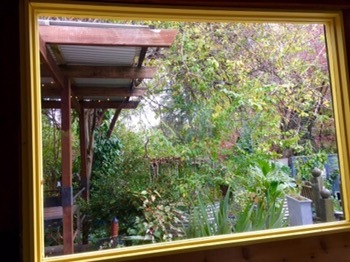 ….but at Pod, there are just so many cute and cozy nooks to choose from. 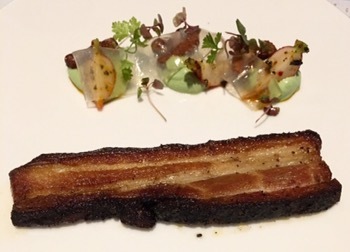 The most difficult decision of the day was whether to enjoy two ($50) or three ($60) courses! Second most tricky was which of the gorgeous options to choose. 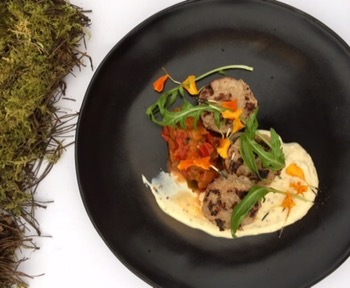 ….and the very decorative Pork sausage with pickled peach, mushroom cream, capsicum and chilli jam. 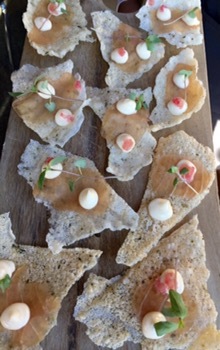 Other choices on the menu were Asparagus spears, with beetroot, caramelised onion, goat’s cheese and rye cracker or Duck rillettes with pickled raspberry, crispy chicken skin and nashi pear. 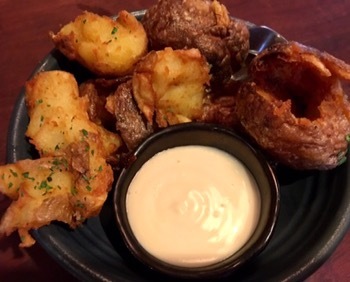 We covered all the mains with the sirloin being the standout dish (along with very popular chilli and rosemary salt baked potatoes and aioli, which Sam thoughtfully threw in for us). 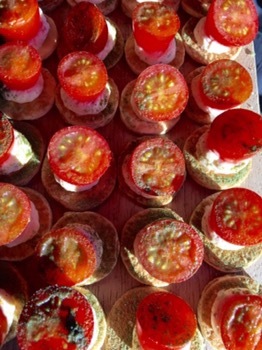 And hugely successful were the desserts…. 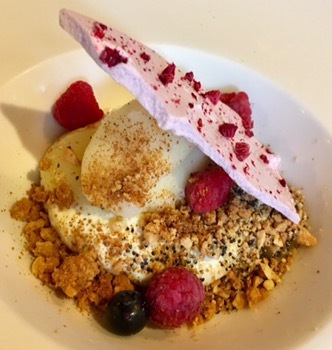 My Lime cheesecake with raspberry, lime get, macadamia, raspberry meringue and pineapple sorbet was a delicious balance of tart, sweet, crunchy and creamy – wonderful! The others loved their Pan perdu cooked in a very aromatic clarified butter with apple tarte tatin ice cream, brandy apple puree, blackberry and white chocolate! Also tempting was the sour cherry ice cream with coconut and oat crumble, chocolate jelly and cherry marshmallow. 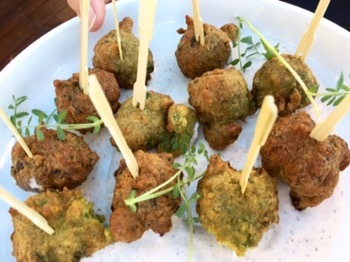 As we chatted about cookbook launches, restaurant recommendations, writing opportunities and of course the wonderful food and atmosphere that Pod Food offers – the new Pod menu was declared a great success!! 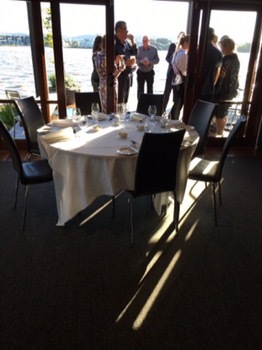 The Boathouse by the Lake, Canberra – excelling at private functions! 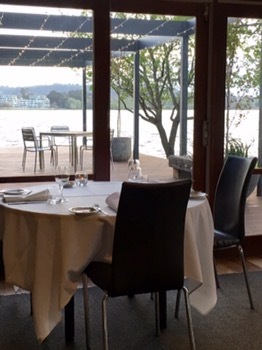 The Boathouse by the Lake may well be Canberra’s best spot for function dining. This is where they really excel. 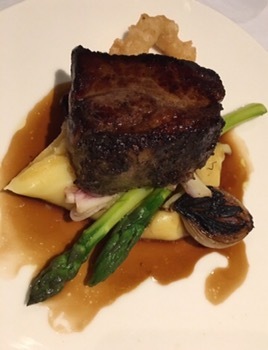 Food and wine is elegant, delicious and well priced. Staff and service is delightful. The setting is perfect. But most of all, they offer a real sense of generosity. 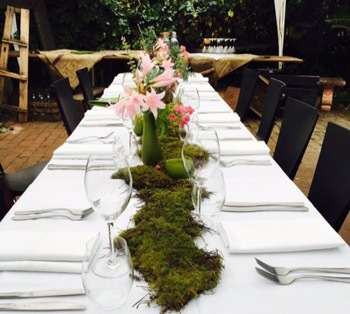 A well set out Private Dining Function Brochure explains the options well. …or West End, looking straight across the lake and more towards Kings Avenue Bridge. All have access to lovely decks, although East End and West End are larger. The minimum spend, particularly at lunch time, is very reasonable – $1,100 for lunch January and April to October, $2,500 in peak times of Nov-Dec and Feb-Mar. 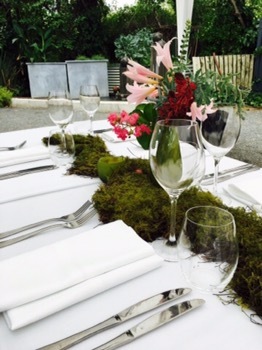 Menu Options start at $77 per person for 3 courses. 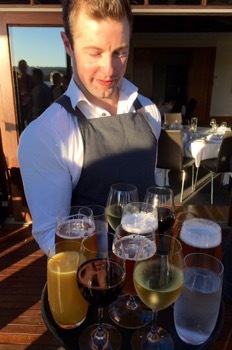 The beverages packages are particularly good starting at $31 per person for three hours for lovely Canberra wines, draught beer, juice and soft drinks. 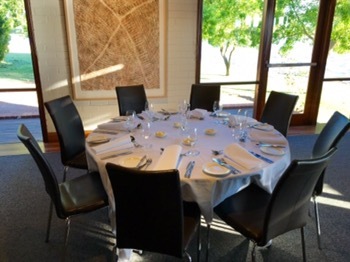 Also good value is the Corporate Two Course Luncheon with 2 hours of beverages for $90 per person. … before being seated at the round tables. Dan and Lauren took great care of us with drinks and savouries and this set the scene for a wonderful evening. 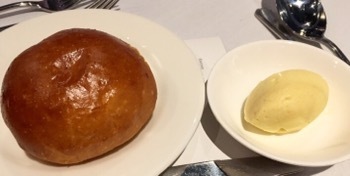 The brioche bread buns and cured butter was excellent too! Everyone was very impressed with their choices and the evening was a great success. 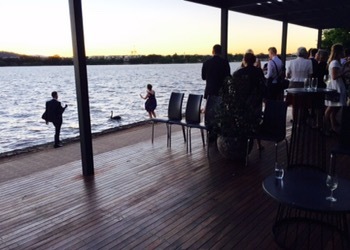 I wouldn’t hesitate to recommend the Boathouse by the Lake for all the ingredients of a successful event. 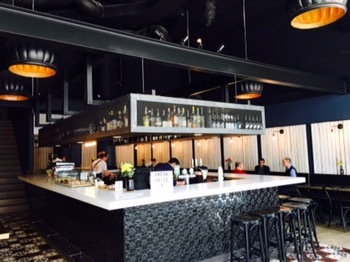 Monster Kitchen & Bar, Acton – Perfect for a Canberra brunch! 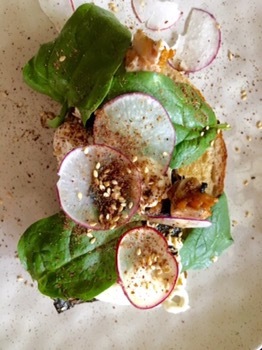 The Monster nature of Monster Kitchen and Bar makes it a perfect choice for a Canberra brunch any day and any weather. 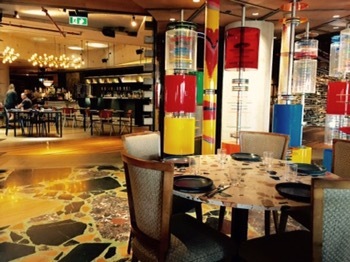 Elegant in both decor and dishes – this interesting and stylish restaurant morphs throughout the ground floor of Hotel Hotel in New Acton taking on new personalities as it fills different spaces. And while the ambiance is fine dining, prices are unexpectedly, very reasonable. My favourite is the Salon, filled with eclectic furnishing and luxurious fabrics that hark back to an era when everyone dressed well to dine. On a cool or rainy day the large open fire that forms an engaging centrepiece is greatly welcome. The underground parking means there’s not need to brave the elements. Thoughtfully, Monster guests can validate their parking tickets to receive half price parking rates. Monster’s cheeky nature also means it’s open early serving breakfast from 6:30am right up until 12 Noon. 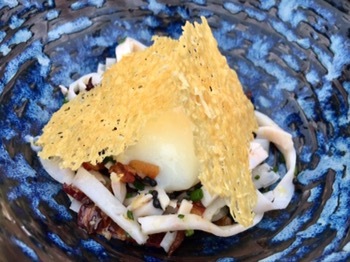 The understated menu underplays the deliciousness of the dishes. 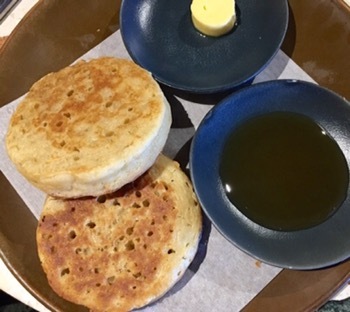 It is easy to miss those moreish, comforting House made crumpets with Hotel Hotel honey, a large serve at the great value price of $11. It’s a must have to share for the table! My table agreed that our favourite dish was actually the Braised lentils with sauteed bitter greens (actually not bitter), oft egg and zaatar $18. 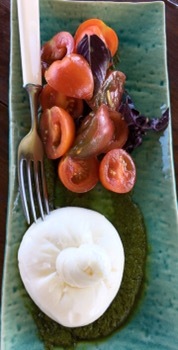 Next was the Poached eggs with avocado, whipped chevre and (great) dukkah $18. 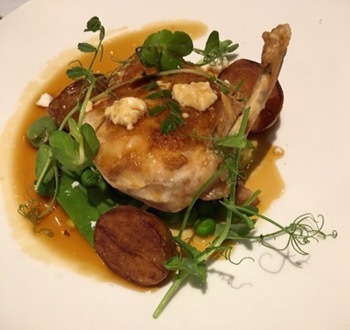 It was also generously garnished with wonderful fresh herbs that completed this excellent dish. 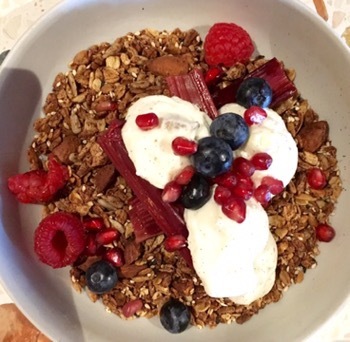 The Spelt and Maple Granola with roasted rhubarb, berries and whipped ricotta is very beautiful and an absolute steal at $13. Full of crunchy nuts and with just the right amount of sweetness, it’s a well put together dish. 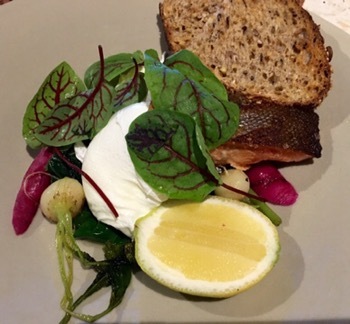 The Confit ocean trout with poached eggs, turnip, radish, spinach and lemon $19 was done well but was not quite as interesting as the other dishes. The Baked eggs with kale, sheep milk feta, chilli and lemon $18 looked a good choice at another table and the Porridge has some wonderful toppings – spiced pear, halva, pistachio and rose $14. I’ve added them to my wishlist for next time. 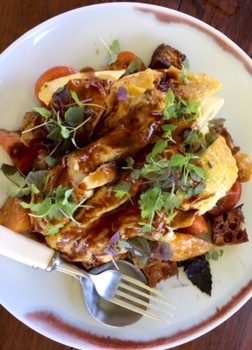 An unexpected added bonus is that Monster also provides breakfast for Hotel Hotel guests, one of Canberra’s most popular places to stay and clearly the choice of TV celebrities and famous chefs. We shared our brunching with four national identities also enjoying the hospitality of Monster. 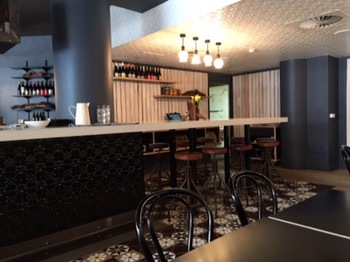 Temporada, Canberra City – a first look! Inspired by Adventures in Winterland ‘s brunch posts I headed to try out Temporada myself. Sadly only open from breakfast until 11:30am weekdays, it is a lovely spot with great service and ambiance. 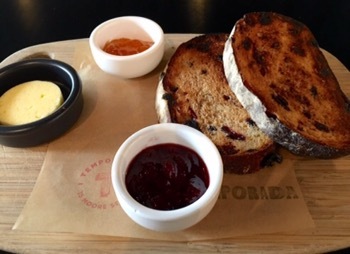 For a light breakfast the Sour Cherry Toast with Cultured Butter and Jams $8 is a good choice. But I do need to go back for the Banana, Coconut and Pecan Waffle $12.